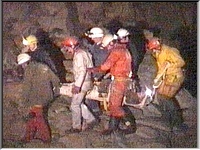 Every year, people get trapped or injured underground while exploring caves or old mine workings, and have to be rescued by volunteer bodies. 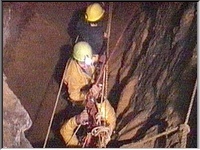 One such organisation is the Shropshire Caving and Mining Club, part of Midlands Cave Rescue Organisation, which holds regular underground practice sessions in order to train members in rescue techniques. 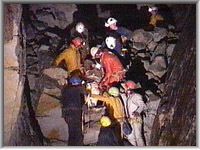 For this recording, the rescue team was given a difficult problem: Deep inside an old copper mine, a man has fallen into a narrow passage and broken his leg. 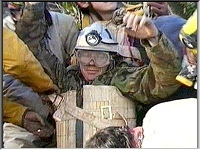 The volunteer casualty will have to be strapped into a stretcher where he lies, then gently manoeuvred past many obstacles before he can be hauled up the mineshaft to daylight. The obstacles include steep rock and sand slopes, passages barely wider than the stretcher, dangerous collapses and deep chasms. This recording shows how the volunteer victim was successfully rescued, and what went wrong!